Portable Camping Fridge Buying guide – What to look in a camping fridge! The task of finding a great value camping fridge that does exactly what you expect can be daunting, but when you are armed with knowledge about the features you should be looking for, you can start shopping without the fear of picking up a dud, that cost you way more than you needed to pay. To start with there are 3 main types of portable camping “fridge” that are available on the market, identifying which one you are looking at will help a lot in narrowing down your search! The first style is a thermo-electric system, these are the least effective and use a thermoelectric ceramic that allows the heat within the cooler to be “sucked out” via a small thermoelectric element, and usually have the ability to reduce the temperature by about 15-20 degrees below ambient. They are on the cheaper end of the scale, but in real world usage, you will find that using a small icebox, or cooler bag with ice bricks will be more efficient at keeping refreshments cool. Despite the affordable price, the ‘Peltier’ technology used in these units has a long way to go before it can compete with the next 2 categories of portable refrigerators. The next style is a 3-way camping fridge, these are one of the most versatile camping fridge systems out there, with the ability to run off of a 9KG LPG gas bottle, 12v power, or 240v mains power. These systems are effective at reducing temperatures by quite a significant amount, however the way a 3 way camping fridge operates requires heating a solution of ammonia, so whilst operating on gas, the camping fridge is quite efficient, however when operating on 12v, the heating element uses around 75Watts of power, resulting in around 6-7amps of power draw, which is about 5-6 times more power consumption than an equivalent compressor style camping fridge. So, a small generator like the Adventure Kings 2KVa Generator might be required to operate this system at a reasonable temperature effectively for extended periods of time, making this a slightly less desirable setup. The last style of refrigerator, is a compressor style portable refrigerator like the Adventure Kings 60l Fridge/Freezer. This style of refrigerator works on the same principal as your refrigerator at home, by compressing a refrigerant and storing the pressurized gas inside a condenser, and releasing the compressed gas in a controlled manner you can quickly and efficiently reduce the temperature of the system, in the same way a gas bottle on a BBQ gets cold after it has been running for a while. With a compressor style of portable refrigerator you tend to use a lot less energy, as there is less resistance in a system that isn’t trying to generate heat. This means the Adventure Kings compressor fridge uses an average of 0.85 amps/hour, making it one of the most effective ways to keep food and drinks cold, when relying on your vehicles 12v system. 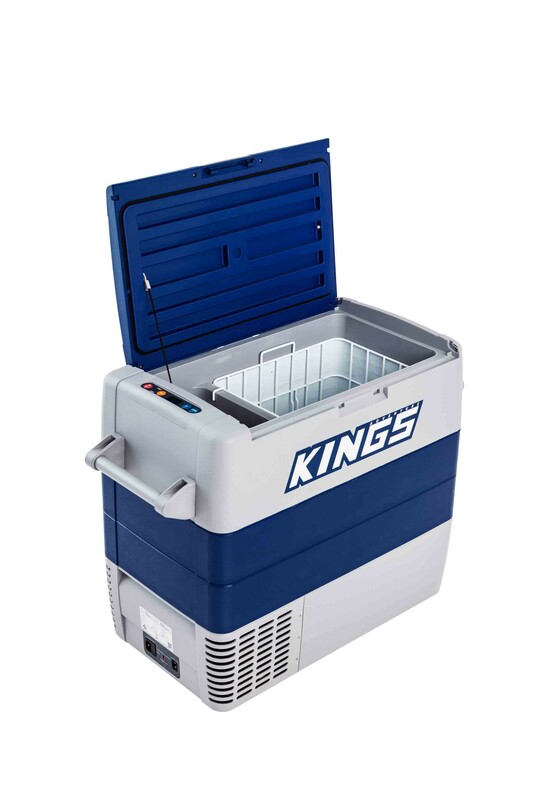 The ability to take advantage of efficient and compact 12v charge systems like an Adventure Kings 120W Solar Blanket to top up the power used by your portable fridge, makes camping fridge systems like the Adventure kings 60L Fridge Freezer extremely popular. The inclusion of high quality internal components also enhances efficiency. The Adventure Kings 60L Fridge Freezer, offers SECOP components, which are one of the industries most efficient and best quality portable fridge component manufacturers, formally known as (DANFOSS) the BD35F SECOP compressor, offers superb performance, and engineered internal wiring make the Adventure Kings Portable Fridge range, on of the best value for money setups available on the market! The Adventure Kings 60L Fridge Freezer, takes advantage of clever temperature monitoring circuitry and uses a set and forget temperature controller and digital LCD display for simple to use controls, and as an added bonus you can also prechill your fridge by plugging it into 240v mains power to chill the refrigerator to the desired setting, ready to plug and play inside your vehicle using a standard 12v cigarette lighter plug, resulting in even less power draw for easy use refrigeration for your cold meats, leftovers, and refreshing drinks! Now you are armed with knowledge about the internal workings that many portable fridges use to stay cold, you can make a better decision about which style best suits your camping needs and setup!